According to legend, the Chim-el Adabal was formed when a drop of blood fell from the Heart of Lorkhan as it was flung to Tamriel, and landed down an Ayleid Well. The magicka within fused it to a strong red crystal, and the Ayleids fashioned it into a great gem. It entered the annals of human history when Akatosh (in some stories Shezarr[UOL 1]) forged the Covenant with Alessia and her (symbolic) descendants while she lay in her death bed. Chim-el Adabal was fastened in an amulet and became the symbol of both the Covenant and the legitimacy of Cyrodiil's rulers. Following the breakup of the Alessian Empire, the Amulet of Kings was lost amid chaotic civil war and its attendant looting. According to legend, a certain King Hrol tracked down the spirit of Saint Alessia, who wore the Amulet of Kings around her neck. They coupled, and a hill named Sancre Tor rose on the spot. The infant Reman Cyrodiil was found upon the crest, wearing the amulet on his brow. The Amulet of Kings was restored to prominence during the Reman years, lending legitimacy to that dynasty. After that time, the Dragonfires ritual became essential to the coronation of each new Emperor. 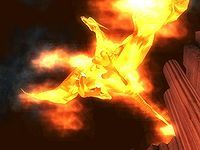 During the ritual, the new monarch was soul-linked to the Amulet of Kings and sent to the Temple of the One to light the enchanted Dragonfires, which then burned until his death. In the middle of the Second Era, the Five Companions embarked on a quest to rediscover the Amulet of Kings. Their leader, Varen Aquilarios, was led to believe that the Amulet could be used in a ritual which would rekindle the Dragonfires and make him a true Dragonborn. This would allow him to be recognized as the legitimate ruler of the Empire. After years of searching, the Companions eventually found the Amulet. In 2E 579, they initiated the ritual in the Imperial City. It was then that Mannimarco, another one of the Companions, revealed his treachery and corrupted the ritual to break the ancient covenant between Akatosh and mortals. This caused the catastrophic event known as the Soulburst. In the subsequent chaos, Sai Sahan took the Amulet of Kings and fled. He then hid it within the ruins of Sancre Tor. The Amulet was recovered from Sancre Tor in 2E 582 by the Soulless One, Abnur Tharn, Sahan and Lyris Titanborn. It was later used to perform the ritual which imbued the Soulless One with the power of Akatosh. However, one of the Companions had to be sacrificed in the process. With the power granted by the ritual, the Soulless One was able to defeat Molag Bal and reclaim their soul. After Molag Bal's defeat, Abnur Tharn took the amulet and fled to Cyrodiil. Although it was suspected he would attempt to use it, unbeknownst to him the amulet's power had been expended for at least a generation. After the long decline of the Interregnum, General Talos reputedly recovered the amulet from the tomb of the Remans beneath Sancre Tor after retaking it from the Nordic and Breton invaders. 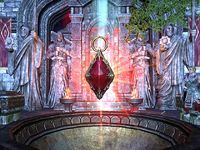 The Champion of Cyrodiil recovered the amulet from the depths of the Imperial Subterrane after the assassination of Emperor Uriel Septim VII at the hands of Daedric cultists. The Champion then delivered it to the Grandmaster of the Blades. 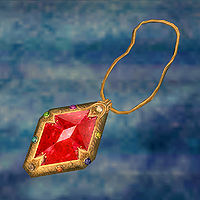 After escorting Martin, Uriel's illegitimate son, back to Grandmaster Jauffre, the Amulet was stolen by the Mythic Dawn. The Champion was forced to enter the Paradise of Mankar Camoran in order to recover it. This achieved, preparations were made for Martin's coronation, but the ceremony was interrupted by a Daedric assault on the capital. After fighting his way to the Temple of the One, Martin was forced to smash the amulet, this being the only way to defeat Mehrunes Dagon. The power of the intermingled blood of the Covenant summoned a rare Aedric avatar in the form of Akatosh, a fiery dragon. Dagon was defeated, but the near four thousand year history of the Amulet of Kings was ended. ^ Meridia's dialogue in ESO. This page was last modified on 27 October 2018, at 02:12.